It seems bicycle shops on the North coast of Tasmania finally realised we all live by the beach because there's been a surge in the stock of cruisers. Not only are they popping up in shops but they are actually appearing on the street, ridden by people. So far, Electra is the most noticeable brand ambassador of Cruiser Land, with Ulverstone bike shop barely able to arrange their window display before having to slap on a 'sold' sticker. I've seen some Schwinns lurking in Burnie bike shop but they don't seem to be shifting, possibly because cruisers are usually 3 gears or less and Burnie is mostly a 5 gear minimum town unlike the largely flat and bike path blessed Ulverstone. So I was surprised and pleased to see this Electra in Burnie tonight, loitering coolly outside a cool bar adjacent, cool new café due to open tomorrow morning. Cool cool cool. Now that's one memorable ride. Even with the handicap of night time phone photography, it's plain to see that this Electra is big on being flashy. I was forced to document it after seeing the flower print rear mudguard from quite some distance away across the street. 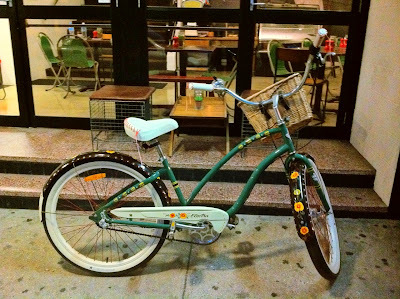 This bike is the polar opposite of the stealth Trek bike in my last Tasmanian Cycle Chic post. This is the kind of bike that your friends would recognise as yours if they saw it parked outside a café, a bike of spontaneous socialising. A bicycle perfect for neighbourhood life because it's too striking to steal. After consulting the Electra website, it seems to be the 'Gypsy' model 3 speed ladies cruiser, although it might be an earlier incarnation as the pattern is different along the top tube. Whatever the vintage, I hope it inspires the cool new café to install some cool new bicycle racks outside so that more cool bicycles and their riders may stay awhile. That would be cool cool cool.